Today we introduce garden themed wedding and party favors to you. Outdoor garden weddings are a whimsical and romantic theme for your big day. HotRef's collection of garden wedding favors feature popular styles like place card/photo frames, tealight candle holders, candle votives, favor boxes and much more flower favors. Send your guests home with memorable favors from your garden themed wedding, bridal shower, birthday or engagement party. 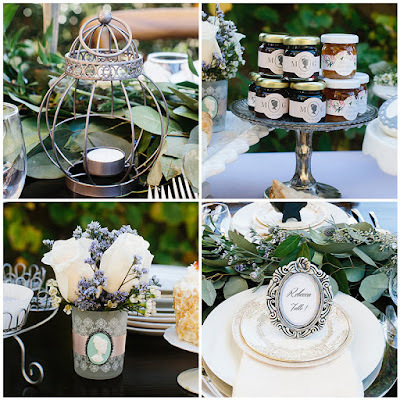 The beautiful Vintage Bird Cage Lantern is an excellent piece to incorporate into your table settings as you set the mood for your romantic English garden theme wedding or tea party bridal shower. With a tea light included, the Vintage Bird Cage Lantern comes ready to illuminate your event! Encompass the sweet Victorian romance of an English garden quite like strawberry jam! As a unique wedding favor for guests at an English garden wedding, or as a tasty treat during a tea party bridal shower, the Personalized Strawberry Jam with English Garden theme comes with a customized label featuring either a classic cameo or elegant floral design theme. As a part of your centerpiece or a thank you favor for your guests, the Vintage Cameo Frosted Glass Tealight Holder from English Garden Collection makes quite the impression! When the tea light inside is lit, each frosted glass tealight holder is inspired by vintage theme cameo design and gives off a soft ambient light with an atmosphere of romance. Antiqued Victorian Oval Shape Photo Frame can be placed at guests tables filled with photos of the happy couple or used as place card holder to add vintage touch to your table decor at your garden wedding or garden theme bridal shower! Each vintage inspired photo frame is made from resin with an antique silver finish and a delicate rose design. Happy planning for a garden themed wedding, bridal shower or engagement! Today we introduce fall themed wedding and party favors to you. Are you planning for a fall themed wedding or party? HotRef offers a unique collection of fall wedding favor items and fall favors. These autumn themed party favors are sure to be a huge hit with your guests. You can choose your favors according to your fall wedding colors for a distinctive effect. Some can be personalized with your personal details to make special keepsakes for your guests which will certainly be fond memories of your special day! Welcome the season of autumn to your next special occasion with these elegant fall leaf bookmarks! Every copper leaf bookmark favor comes in the shape of a leaf and is intricately designed with cut out details. Use these beautiful fall leaf bookmarks to put the finishing touch on your wedding, anniversary, birthday, bridal shower or all other autumn themed events! Break out the good wine and great memories with these autumn themed fall leaf wine bottle stoppers! Your guests will love these autumn bottle stoppers with their bronze metal cut out maple leaf toppers. An amazing choice for fall themed birthdays, weddings, bridal shower, anniversaries and so much more! 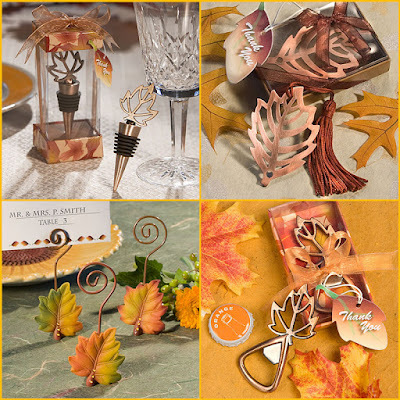 Celebrate the coming of autumn with these beautiful fall leaf designed place card holders! Each leaf table number holder comes with a coiled wire holder and stem connecting to a rhinestone accented leaf in one of three assorted designs. Use them to complete your wedding, anniversary, birthday, bridal shower, baby shower and all other autumn themed events! Celebrate the coming of autumn with these radiant leaf designed bottle openers from the "Autumn Magic Collection". Each chrome fall leaf bottle opener has a cut out leaf perched atop a metal loop opener. Packaged in a gift box with a leaf design "Thank You" tag, this favor is ready to hand out for weddings, anniversaries, birthdays, bridal shower. Happy planning for a fall themed wedding, anniversary or birthday party! Today we introduce sweet baby love baby shower favors to you. Are you planning a sweet baby shower filled with love for your baby girl? HotRef's Baby Love favors including champagne glass, tea light holder, place card holder, heart soap and forth on that are sure to add a sweet and adorable touch to your baby shower of girls. Some favors are imprinted with gold glitter hearts which will add a sparkle to your special day! Make an extra special toast with this Personalized Stemless Champagne Glass from the Baby Love collection. Each glass favor is designed in the shape of heart showed printed "Baby Love" accented with your names and event details front and center. Fill them with sparkling wine or sparkling cider or anything you want. Add a little sparkle to your special day with our "Heart Of Gold" Gold Glitter Frosted Glass Tea Light Holder. Each little tealight holder is finished with small printed pink hearts and large gold glitter heart applique. Place them on guest's tables as table centerpieces. Perfect for setting a mood for celebration at your love themed baby shower. Welcome your guests to their seat with style using our Pink and Gold Heart Place Card Holders. Each heart-shaped resin place card holder includes three designs: pink and white stripes, pink with white polka dots, and pink with gold glitter. These place card holder favors are sure to be the focal talk of your event as the place card table is usually where they'll go first. Our "Heart Of Gold" Scented Heart Soap is the perfect thoughtful favor for love themed baby shower! Each heart shaped soap comes with a fresh scent and makes quite the presentation in a pink and white striped box adorned with a gold glitter heart, and a gold foil sliding tray holding safely the soap inside. The soap favors are sure to make an impression if you hand them out as give-away gifts for guests. Today we introduce the most popular 50th gold anniversary party favors to you. No matter how you look at it, 50 years of anything is a grand mile marker. If you are planning a 50th gold wedding, 50th birthday, 50th class reunion, 50th company celebration or any 50th anniversary, HotRef's 50th gold party favors including bottle openers, candle favors, bottle stoppers, key chains and forth on are perfect for you! Our Gold 50th Anniversary Design Bottle Openers will be great for celebrating a golden anniversary, a birthday, or any other occasion commemorating a fantastic 50 years. The handle of the bottle opener features a bold gold '50' with embedded clear round rhinestones. Useful and simply charming, the 50th theme bottle openers will quickly prove their practicality while inspiring fond memories of the day spent with friends and family. Celebrate a blissful century together with these Golden 50th Anniversary Candle Favors! With its frosted white glass holder and brilliant gold, rhinestone enhanced "50", there is no better way to ring in the big five-oh. These 50th anniversary candle holders are perfect for any anniversary you may be planning! Fifty years of marriage is truly something to be celebrated! Do that and so much more with these darling gold star designed 50th anniversary candle favors! Every golden anniversary tealight holder is hugged by gold metal coils and decorated with "50". At the top of the coil is a gold star with "50" in its center, reminding you of why the occasion is so very special. Celebrate a blissful century together with these 50th anniversary bottle stoppers! With this gold wine bottle stopper, three dimensional "50", there is no better way to ring in the big five-oh. Magnificent for any anniversary you may be planning! Fifty years is an outstanding milestone for a plethora of special occasions. The Golden-50 wine bottle stoppers will be a practical and memorable accent for gold 50th wedding anniversary, birthday, class reunion, and more. The gold metal bottle stopper features a conical base with black rubber gasket and is topped with a shinny 50 charm accented by sparkling rhinestones. Celebrate a blissful century together with these 50th anniversary key rings! With its sturdy chrome chain and beautiful gold, three dimensional "50",these gold marriage key rings favors make it the best to ring in the big five-oh. Magnificent for any anniversary you may be planning! Happy planning for a gold 50th anniversary party! Today we introduce "Cute as a Button" baby shower favors to you. Mom always says, "Button up to stay warm and cozy!" HotRef "Cute as a Button" favors include photo frames, personalized milk jars, scented soaps, personalized candle tins and so on forth which are full of warmth for baby shower or baby birthday! Welcome your new little family with "Cute as a Button" baby shower favors at HotRef! We have a rainbow of buttons cozying up to create this "Cute as a Button" Round Photo Frame / Placecard Frame so full of warmth for baby showers! The funny thing is, it makes thanking your shower guests a snap! You can also use this as a place card frame to assign seats. Your guests will be happy to see the assignment with such cute frame. Cute and sweet, just what your need for a delightful baby shower. This Personalized "Cute as a Button" Printed Milk Jar features light pink pad printing with "Cute as a Button", and is waiting to be filled with your special sweet. Cotemporary yet vintage, your guests are sure to be charmed by this sophisticated beauty. With adorable Cute as a Button Scented Soap, it brings an enchanting expression to your baby shower party. Each round and pure-white soap has lightly scent and a button shape. This cute button scented soap sits in a bed of shredded and natural raffia, wrapped with gift box which has a pale-lilac base, a white top accented with polka dots in pastels of pink, blue, green, yellow, gold and lilac, the words "Cute as a Button One Scented Soap," and a white-satin ribbon and bow embellished with a small, white button in the center. It's a little bigger, but as cute as a button. This "Cute as a Button" Personalized Travel Candle Tin makes a perfect favor for your gender reveal party. Portable and adorable, your can enjoy the fresh scent wherever you go. Optional personalized sticker comes with multi-colored polka dots surrounding "Cute as a Button". Perfect for celebrating the new little light in your life! Happy planning for a baby shower or baby birthday with HotRef's "Cute as a Button" favors! Today we introduce good luck elephant wedding and party favors to you. Can't find a customary elephant to celebrate your big day? Our Indian Wedding Favors feature the majestic elephant in many favor designs. These favors include place card holders, bottle stoppers, key chains, candle holders and so forth which are sure to add good luck to your weddings, anniversaries, birthdays and more grand celebrations! Put some elegance into your wedding, anniversary or bridal shower with these enchanting Chrome Elephant Place Card Holders! Every silver elephant place card holder has an elephant base connected to a wire stem and holder showing your guests to their seats. Share your good fortune with friends and family when you direct them to their seats at the wedding reception dinner. The Lucky in Love Silver-Finish Lucky Elephant Place Card/Photo Holder favors are not only endearing, but classy. It features a small slit that can also hold small photos or memos to be put on display later. Perfectly practical and lovely, they're certain to be one unique gift. Give guests good fortune as they commemorate the day with the happy bride and groom. 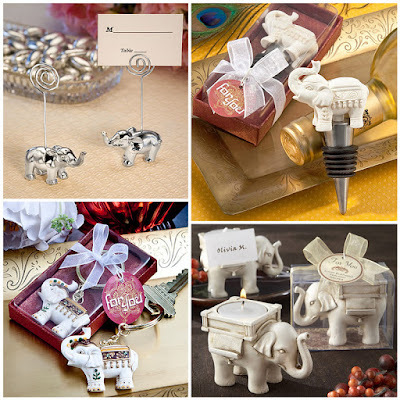 The Good Luck Elephant Bottle Stopper favors will be a charming accent to the special day. A poly resin intricately detailed elephant charm with up-swung trunk symbolizes good luck and perches atop a stainless steel conical bottle stopper base, complete with a black rubber gasket. Also ideal for an Asian wedding, bridal shower, or anniversary, the elephant bottle stopper is not only endearing, but practical. Our Majestic Elephant Key Chains are not only an endearing gift for your loved ones, but are also practical and certain to spark fond memories of the occasion. The ivory poly resin elephant charm is hand painted with intricate gold, green, and brick-red details, including a decorative blanket and head covering. A traditional symbol of good luck, the elephant keychain with their colorful design will an excellent addition for Indian weddings, bridal showers, and all of life's events that could benefit from some good fortune. "Lucky Elephant" Tea Light Holder is a gorgeous wedding favor. Stately elephant is handsomely detailed and crafted from resin with an antique-ivory finish. Lipped rug under the howdah (that's elephant for "saddle") can hold a place card or photo on either side. Elephant statues with raised trunks are considered a source of luck and good fortune. Lucky gift will bring your guests lucky! Bring some good fortune to all at the upcoming celebration with the Good Luck Elephant Candle Holder. It will be a charming part of the occasion when you use them at the place settings for your guests. Each candle holder is made of an ivory poly resin depicting a well-adorned elephant with the holder on its back. These are beautifully decorated with the traditional rug with tassels, a carrier, a headdress and foot accents with dazzling rhinestones, in a vibrant array of green, cranberry, and gold. If you are planning an Indian wedding, you've chosen a great guest favor with these Lucky Elephant Golden Tealight Holders. These Indian themed wedding decorations are sure to add a soft, inviting glow to your venue. Either way, you can hand these gold elephant candle favors out to friends and family after the party's over. They can use them again and again at home so that good luck always with them. Happy planning for a wedding, bridal shower, anniversary or birthday with HotRef Good Luck Elephant Wedding and Party Favors! Today we introduce popular Personalized Party Favors to you. A classic collection of personalized favors for all events at HotRef. Choose from a wide array of popular favors monogrammed or personalized that are custom made for your event. 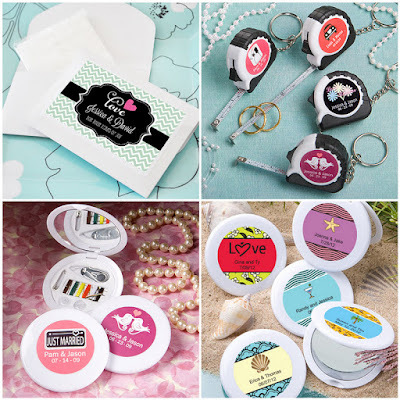 From baby shower party favors to wedding favors, from bridal shower party favors to birthday party favors, make a bold statement with these unique personalized giveaways. As you walk down the aisle on your wedding day, and also during the toasts, heartfelt moments are bound to make your guests cry tears of joy. Help your guests dry those eyes with our stylish "Tears of Joy" Personalized Tissue Packs. Each chic pack of 7 tissues comes encased in a white folder personalized with your own thoughtful wishes. Complete with hinges and a handy glass mirror and sewing kit on the inside, these Personalized Sewing Kit Favors will be a sure hit with your guests! Personalized sewing favor contains a safety pin, two needles, a threader, two spare buttons, and a variety of threads. Take advantage of the option to add personalized labels with a background color, graphic, and 2 lines of text, or order them blank! Measure out some appreciation for your guests with these cute Personalized Key Chain or Measuring Tape Favors. Each measuring tape keychain has a hard plastic outer case with black sides and a retractable metal measuring tape, all attached to a silver metal chain and key ring. Take advantage of the option to add personalized labels with a background color, graphic, and 2 lines of text, or order them blank! Well-suited for weddings, bridal showers, anniversary, sweet sixteen and so much more! These cute Personalized Compact Mirror Favors are perfect for adding that missing element to your special occasion! Each compact mirror has a double-sided glass interior protected by a white poly resin compact case that is perfectly fit to apply an optional personalized label of your choosing. Take advantage of the option to add personalized labels with a background color, design, names and date, or order them blank! Happy planning for a party with HotRef's personalized favors! Today we introduce Most Popular Wedding Favors with Love and Heart Design to you. Are you planning for a wedding or bridal shower? HotRef has plenty of romantic and sweet items for you. 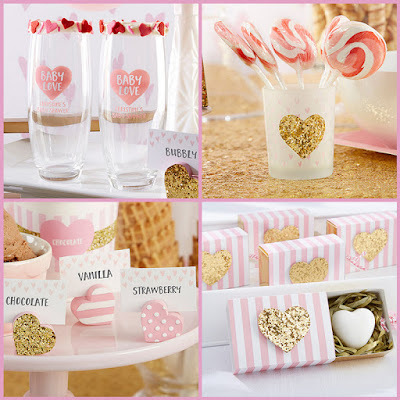 Recently, the most popular favors for wedding or bridal shower are designed with love and heart. Some can be personalized with your personal details to make special keepsakes for your guests which will certainly be fond memories of your special day. The "Spread the Love" Chrome Spreader with Heart-Shaped Handle is everything an elegant wedding favor should be designed for today's contemporary tastes, practical, sparkling with style and impressively gift-wrapped. From the distinctive, black-and-white gift presentation to the unique, heart-shaped design handle, the love chrome spreader will happily make its way to the homes of your guests. Usher in the happy wedding with symbols of hugs and kisses for your loved ones. Our "Hugs & Kisses from Mr. & Mrs." Chrome XO Bottle Opener is the perfect accent to a variety of His and Her celebrations. A perfect gift for bridal showers and weddings and other romantic events, these shiny chrome XO bottle openers will certainly be a fond memory of the special day. The beautiful wedding is all about the bride and groom exchanging hearts with one another. Our Simply Elegant Key To My Heart Bottle Opener is a wonderful way of commemorating the romantic union of the happy couple as well as bridals showers, and other romantic celebrations. These silver finish heart key bottle openers will bring about fond memories each time the friends and family go to open a bottle of their favorite beverage. Tell straight out you and your loved one's love story, there's no better gift than this Love Chrome Silver Bottle Opener. Romantic script spells the word Love in metal with a shining, chrome finish, this bottle opener have discretely and beautifully incorporated a bottle opener into the word Love. 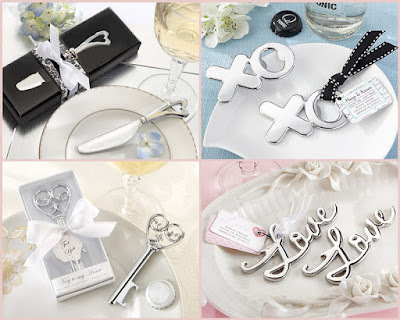 It truly is the perfect favor for love themed wedding or bridal shower. Happy planning for a romantic wedding or bridal shower! Today we introduce 50th Gold Anniversary Wedding Party Favors to you. Planning a 50th gold wedding anniversary, 50th birthday, 50th class reunion or 50th milestone celebration? 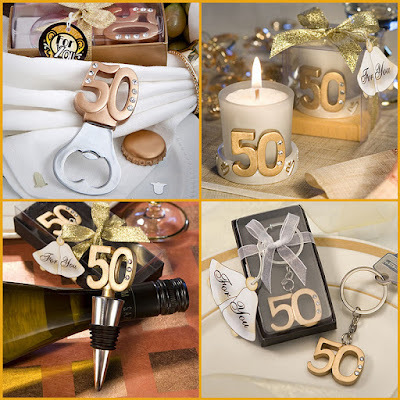 HotRef has plenty of 50th gold anniversary favors from 50th wedding or birthday cake, 50th candle holder, 50th bottle opener, 50th keychain, 50th gold bottle stopper to 50th anniversary guestbook that are perfect to decorate your 50th gold celebration. You can also personalized party favors with personal details. After watching this video, you can find 50th gold anniversary party favors at HotRef. Happy planning for your 50th gold celebration! Today we introduce "Under The Stars" wedding and party favors to you. Nothing's more romantic than getting married or holding party under the stars! 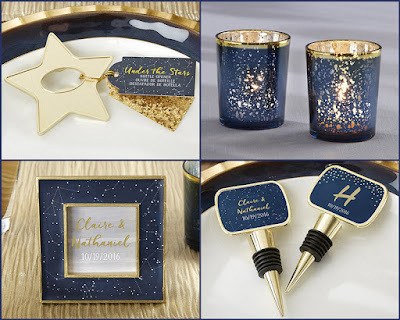 HotRef "Under The Stars" favors include bottle openers, wine stoppers, place card holders, candle holders and much more navy and gold party favors. Some favors can be personalized with your names, monogram or event date to make unique giveaways for your family and friends. The Gold Star Shaped Bottle Opener with Navy and Gold "Under The Stars" Gift Tag will be the star of the show at your party! Add a touch of classics to wedding reception guest tables with these gold-adorned beauties, or hand out these gold star bottle opener favors directly to friends and family. Presented with a navy blue and white gift tag that features a white constellation design with "Under the Stars" printed in gold foil. Open your mind to a great personalized favor that your guests will be able to use again and again. Our Personalized Gold Bottle Opener with Epoxy Dome - Under The Stars can be personalized with your names, monogram or event date on a beautiful navy blue sticker. Put every frame-worthy moment on display with "Under The Stars" Navy and Gold Constellation Place Card Frame! It is a square resin frame features a navy background with white star constellations design, and beautiful gold borders These star-themed frames are perfect for decorating your party tables or to display menu cards at the buffet. Imagine these beautiful Personalized Gold Bottle Stopper with Epoxy Dome - Under The Stars at your moon and stars wedding. Isn't that a picture-perfect sight? This bottle stopper favors include your event details under an epoxy dome for protection. Choose from two beautiful navy blue Under the Stars stickers to make them your own. Picture our Blue Mercury Glass Tea Light Holder - Under The Stars scattered around your wedding, casting a soft glow on guests' faces. Look closely, and you'll notice that it looks like a starry night sky, with bright specks of light peeking through the navy mercury tea light holder. Happy planning for a "Under The Stars" themed wedding or party!